The Sphere Refugee Tent, a tent designed by Formstark, an industrial, interior and exhibit design company based in Köln, Germany, provides disaster victims with not only a shelter, but a sense of community. The tent’s circular form embodies the concept of community through form and function. Designed to withstand extreme weather conditions, the tent creates a space in which families can cook and gather while still maintaining some sense of privacy. The 19 individual sections of the structure, which can accommodate three occupants comfortably, can be opened up into larger sections by unbuttoning the partition walls. Plans for the tent include a cover constructed of PVC canvas. The outer tent of the sphere will be waterproof, while the inner tent will be made of a lightweight nylon. 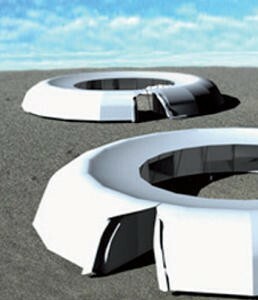 Due to the tent’s unique shape and potential ability for use in a variety of circumstances, Formstark won the 2008 Red Dot Design Award for design concept of a habitat.